One of my favorite parts of the holiday season is all of the parties with delicious food, great company and of course, an opportunity to dress up! For this year's celebrations, this Ann Taylor sheath dress will be on major repeat. I am obsessed with the fringe — it is a trendy take on a timeless silhouette. 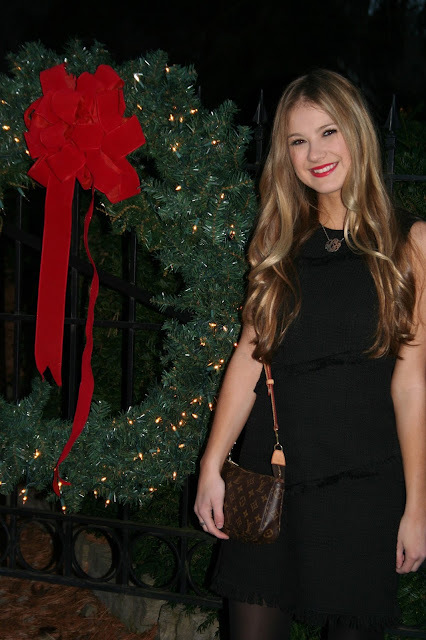 Below I have included some of my other favorite party dresses to make your holiday merry and stylish. Click on the pictures to shop! What will you be wearing to your next Christmas celebration? It is finally the most wonderful time of the year! I love decorating the tree, wrapping presents and watching all of my favorite Christmas movies like Christmas Vacation and Home Alone. Did I mention eating all of the cookies and candy canes in sight? However, now that I am in college, the holidays seem just a little less cheery. Between walking in blustery conditions to class and cramming for four back-to-back finals, I nearly forget to enjoy the season. To remind myself, I have been trying to listen to my favorite Christmas tunes while studying and I even put up a miniature tree in my room. But in just one week, finals will be over and I can finally focus on celebrating the season with my friends and family! Here is my gift guide for all of the fabulous gals in your life (and you may want to add some of these to your own Christmas list...). Perfect for the girliest-girl you know, seek out sparkly accessories and candy-colored sweaters to make their holiday sweet. You can't go wrong with any of these timeless classics — look for well-made items that will last her for years to come. For the coolest girl you know, stick to neutrals and clean lines, and stay away from busy patterns. Give her a gift better than Santa himself with a sharp-looking watch or black shades. For the girl who makes every day an adventure, whether its traveling, hiking or just exploring new parts of town, give the gift of function and fashion — with durable, vintage-inspired items that can withstand her lifestyle. All of these items are perfect for the girl who doesn't need a New Year's Resolution to head to the gym. I'm especially obsessed with the S'well water bottle, which comes in a variety of stylish hues and patterns. What are your favorite gifts to give during the holiday season?